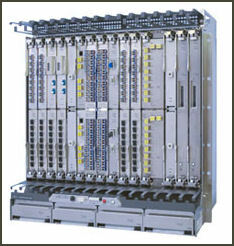 Fujitsu optical network Fujitsu is Japan’s largest software and computer service and a supplier of telecommunications equipment. Based in Tokyo, it has over 100,000 employees and has traditionally been known as a computer maker. The oldest computer still in operation in Japan was made by Fujitsu. The company also makes chips and business-related computers. Fujitsu saw its profits shrink in the period from April 2010 to December 2010. It made a profit of ¥47.16 billion ($579 million) in the April-September 2010 period. Fujitsu plans to resume exporting cutting-edge supercomputers in 2011 after a ten-year break. The company is promoting its next-generation “K Computer” which combines more than 800 small computers to perform calculations at a speed of 10 quadrillion times a second, five times faster than the world’s fastest models in 2010. In May 2009, Fujitsu announced it had developed the world’s fastest CPU (central processing unit), capable of performing 128 billion calculations per second, breaking a records previously held by Intel. Fujitsu has held talks with Toshiba and IBM about forming an alliance. Fujitsu lost $2 billion in fiscal 2001-2002 and laid off 16,400 workers. It struggled in 2005 and was was hurt by computer errors at the Tokyo Stock Exchange, which has a computer trading system designed by Fujitsu. It was has been doing better after concentrating on supplying hard disc drives for portable music players, video cameras and portable commuters and it made a profit after spinning off its unprofitable memory chip division. In November 2005, the Tokyo exchange shut down trading for most of the day because of a failure of the computer system. The computer problem raised questions about whether the stock exchange’s computer system---built by Fujitsu---was up to date and capable of handling the volume of trade that the exchange experiences. The computer system had just been upgraded and failed to start normally when it was switched on about 6:30am and was unable to retrieve important information such as the names of security houses necessary for accepting trade orders. Fujitsu created both the hardware and software for the system. Officials with the company said the breakdown was due to a glitch in the software and didn’t have anything to do with the upgrade. The mistakes were blamed on the inability of the computer system to keep up with the increased volume of trades that had resulted from an increase of investments by foreigners and day traders who often make trades using the Internet or cell phones. Fujitsu lost ¥275 billion in fiscal 2006-2007. It left the flat-screen television business to focus on computer network servers and semiconductors. Of late Fujitsu has had problems with its hard disc drive business and is considering selling it. In 2008 it spun off its semiconductor operations. In September 2009, Nozoe suddenly resigned, and then came back in March 2010, demanding that his resignation be nullified on the grounds that he was forced to resign for a fabricated reason (his alleged contacts with “antisocial forces,” a euphemism for organized crime) . A nasty fight then ensued between Nozoe and the board of directors that essentially ousted him. In the meantime, many reforms that Nozoe made have quietly been undone and people he exiled have been brought to high positions. The response among investors, in may cases, has been to sell their Fujitsu stock and run. In March 2010, Fujitsu announced that it had built Japan’s fastest supercomputer. Made for the Japan Atomic Energy Agency, the computer is capable of performing 186 trillion calculations a second and was ranked as the world’s 19th fastest supercomputer. K was built and jointly developed by Fujitsu and the government-backed RIKEN research institute, Located at the Riken Advanced Institute for Computational Science in Kobe, Japan, it represents a giant leap forward in speed and is a source of national pride for Japan, at least among computer scientists, who take the race for fastest computer quite seriously. “It’s a very impressive machine,” Mr. Dongarra said. “It’s a lot more powerful than the other computers.” The cost of building is about $1.3 billion. The latest ranking of the top 500 computers is determined by running a standard mathematical equation. The winning computer was able to make 8.162 quadrillion calculations per second, or in more technical terms, 8.162 petaflops. K is made up of 672 cabinets filled with system boards. Although considered energy-efficient, it still uses enough electricity to power nearly 10,000 homes at a cost of around $10 million annually, Mr. Dongarra said. The performance of K is equivalent to linking around one million desktop computers, Mr. Dongarra said. The research lab that houses K plans to increase the computer’s size to 800 cabinets. That will raise its speed, which already exceeds that of its five closest competitors combined, Mr. Dongarra said. “K” is short to the Japanese word “Kei,” which means 10 quadrillion, the ultimate goal for the number of calculations the computer can perform per second. A quadrillion is equal to 1,000 trillion K succeeded in pushing the previous leader, China’s Tianhe-1A supercomputer, at the National Supercomputing Center in Tianjin, China, to second place. Tianhe-1A had been the first Chinese computer to be ranked on top, signaling the country’s growing technological might. The fastest computer in the United States, at Oak Ridge National Laboratory, in Oak Ridge, Tenn., placed third. In autumn of 2009, it was decided, in effect, that the supercomputer project should be frozen during a government budget-screening process. In one widely shown exchange the head of the project to build advanced supercomputers was asked to offer some good reason why the government should fund the project. The project head said to advance science and compete with the United States. The head of the panel responded by saying, “Does it matter if the United States is No.1...What’s wrong with being No. 2 in the world? and refused a request to increase funding. Scientists, including some Nobel laureates condemned the freeze, arguing the money was vital for Japan to remain competitive in technology fields. The project was revived. Two of the companies participating in the project withdrew in May 2009. In November that year, House of Councillors member Renho of the Democratic Party of Japan, during the government's screening process of publicly funded projects, raised the famous question: "What's wrong being No. 2?" throwing into doubt the need for Japan to regain the world's No. 1 status in the field of supercomputing. An appeal by scientists to complete the K computer project as a symbol of Japan's strength in science and technology, and an expression of public support, prevented a freezing of the budget for the project, encouraging members to carry it out, Watanabe noted. The project was led by Tadashi Watanabe, a scientist named to the position as recognition of his role in developing core technologies for the "Earth Simulator" supercomputer. While the project was be being scrutinized by the government as wasteful Watanabe's wife Mari was pronounced by doctors to have only six months to live. Watanabe did his utmost for his ailing wife, going back and forth between her sickbed and his workplace until she died from cancer. "I would have been really happy should I have been able to share with her the joy of the K computer's completion, which my wife was looking forward to seeing more than anyone else," Watanabe told the Yomiuri Shimbun with tears in his eyes. NEC provides technology services and makes computers and other electronic devices. It was Japan’s largest PC maker and third largest chip maker and is a major producer of telecom gear and cell phone handsets. It was the world’s largest chipmaker in 1988 but is only 10th today. It was Japan’s No. 1 domestic supplier of personal computers and was the world’s second largest PC maker in the 1990s after taking over rival Packard Bell in 1995. But in recent years it has fallen way off the mark as it has failed to keep abreast with new trends---namely the strategy by Dell and Hewlett Packard to aggressively sell their own models at attractive prices as PC themselves became more and more alike. NEC withdrew from the international PC market in 2009. NEC has 116,000 employees. NEC has developed bioplastic that a shape memorizing property that allow it return it original shape when it is heated, The material has been sed to make flexible ell phone ad was featured in an episode of CSI. In January 2007, a team of researchers from the Japan Science and Technology Agency and NEC developed encryption communication technology that was impossible to break. It issues quantum cryptographs, which is theoretically impossible to crack, figured out a way to apply the technology to transmission devices. Earth Simulator was ranked as the world's fastest for five consecutive six-month terms from 2002 to 2004. But the holder of the top spot has changed every year in recent years. The NEC-GS40 NEC uses vector procession, a method of using specialized hardware to solve complex problems pioneered Seymour Cray, developer of the Cray supercomputers. Financed by the government and built by NEC, it required $350 million and five years to make and was installed at the Earth Simulation Research and Development Center in Yokohama to study climate change and create accurate models to study changes in the earth’s atmosphere, oceans and crust. People in the American supercomputing industry were shocked by the development and called it the “Japanese Sputnik.” Calculation of climate are done by dividing the world into small boxes, each with data on humidity, temperature and other variables, and making calculations of changes in these boxes over time. Old supercomputers could mange boxes that were roughly 30 miles square. The NEC-GS450 can do calculations for boxes that are six miles square. In 2009, NEC and Hitachi said they were withdrawing from a super computer project as part of an effort to cut losses in the face of the global recession and reduce research and development costs. Fujitsu has decided to build the next-generation supercomputer on its own after its partners NEC and Hitachi withdrew from the project. The new Fujitsu machine is expected to be completed in 2012 and achieve 10,000 trillion calculations per second. In November 2010, the Earth Simulator supercomputer was ranked the world’s fastest in complex calculations(it was the fastest in an international ranking of calculating the Fast Fourier Transform algorithm). It ranked forth in doing simple calculations. A few months earlier the Earth Simulator was tweaked to achieve a computing speed of 12 trillion calculations per second. NEC was deeply in debt and laid off 15,000 workers, 15 percent of it workforce, in 2001. It lost money in 2007 and 2006 and shut down chip plants and concentrated on making chips for cars and consumer electronics., including Nintendo’s Wii game, only to lose $2.9 billion in fiscal 2008-2009. NEC lost ¥12.52 billion (about $140 million) in fiscal 2010-2011on sales of ¥3.12 trillion. (about $370 billion). The loss was largely due to sluggish demand in the information technology services sector. NEC was back in the black in fiscal 2009. It made a profit of ¥11.43 billion in fiscal 2009, a dramatic turnabout from the previous year when it lost ¥296.65 billion mainly because of a plunge in business structure improvement costs and losses in its securities holdings. NEC plans to launch a 3-D PC in the autumn of 2010. It will cost $150 to $200 more than a regular PC and require special glasses to use. It will have special software that can convert 2-D images into 3-D ones. NEC released a 3-D computer in 2004 but it didn’t catch on, partly because there was little 3-D software and the technology tacked on an extra $400 onto the price tag. NEC’s recent poor performance in the PC market led it form a tie up with Lenovo to help it keep its No. 1 position in the domestic market. Under the agreement Lenovo would hold a 51 percent stake and NEC a 49 percent stake, giving Lenovo effective control of the venture. In July 2011, NEC-Lenovo said it aimed to capture a 30 percent share of the Japan PC market.